Professor María del Carmen Arrieta has a Doctorate in Business Administration and Management from Polytechnic University of Catalonia, Spain, a Master’s degree in Teaching in Higher Education from Universidad Andrés Bello, Chile, and a Bachelors degree in Economics from Universidad de Lima, Peru. She holds a Certificate in Teaching from Polytechnic University of Catalonia, Spain (DEA) and a specialization in Finance and Marketing from Universidad Peruana de Ciencias Aplicadas, Peru. María del Carmen Arrieta has been a professor and coordinator for more than 18 years. She has taught and coordinated the economics courses at Universidad Peruana de Ciencias Aplicadas. 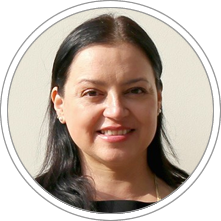 Professor María del Carmen Arrieta currently is Professor and Researcher at the Finance, Business Economics and Accounting department at CENTRUM Católica Graduate Business School. Award for full time faculty academic excellence in Master’s Programs, CENTRUM PUCP, 2018.